In honor of both the RT Booklovers Convention in Las Vegas and the publication of IMAGINES by Anna Todd and other WattPad authors, we had one of our XOXperts try her hand at writing her first “imagines” short story! Find out what happens when Katrina T. runs into Johnny Depp at a hotel in Las Vegas, and don’t forget to pre-order your copy of IMAGINES- available on 4/26! As I was walking into RT Convention, I swear I caught a glimpse of Johnny Depp out of the corner of my eye. He looked panicked and frustrated. I didn’t want to seem like a crazy fangirl, but I decided to approach him and see what had him in such a tizzy. He turned around, and I couldn’t speak over the bubble caught in my throat. Finally I was able to get the words out. “Is everything okay,” I asked. He looked a little confused. He informed me that he was looking for his guitar. He had set it down after practicing with his band, but couldn’t remember where he put it. There were so many people in the hotel that week and it didn’t seem too far-fetched. I told him I would help him look and we set off. Navigating the crowds was insane, but we just knew if we kept at it that we would find it eventually. We scoured each floor until we finally found it sitting in a corner on the tenth floor. I was supposed to be meeting some friends at one of the parties, and was freaking out about being late. I told him I was happy he found his guitar, and started running down the hallway so I could hurry up and get ready. I heard my name coming from the direction of Johnny Depp, and turned around. He told me that he’d be happy to attend the party with me since I helped him find his guitar. I may have had a tiny heart attack from excitement. I told him I’d meet him in the lobby in thirty minutes and dashed off to get ready. As I approached him, he stood and met me halfway. He spun me around and placed my hand in the crook of his elbow. Such a gentleman. We had all heads turning as we walked into the ballroom. I was the luckiest girl in the room. Swoon!!!! I would die if this happened to me (I’ve had a thing for pirates long before CJS.) As a writer of fanfic long before it was a thing (Scarecrow& Mrs. King back on the 80’s) I still work on it for the long tried House MD. 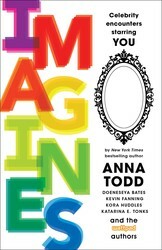 I was so thrilled to get a copy of Imagines, can’t wait to read it!